Traditional in design and modest in scale, the elegant Mayville Collection is classic beauty at its finest and RC Willey has it. Featuring a burnished brown cherry finish, antiqued metal bale hardware and distinct framing, this collection is a perfect addition to your timeless bedroom. 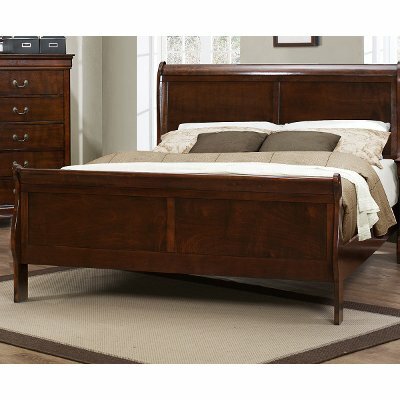 Traditional in design and modest in scale, this elegant queen sleigh bed is sure to impress and RC Willey has it! Featuring a burnished brown cherry finish and all of the traditional flare unique to the style - antiqued metal bale hardware and distinct framing- this collection is a perfect addition to your traditional bedroom. 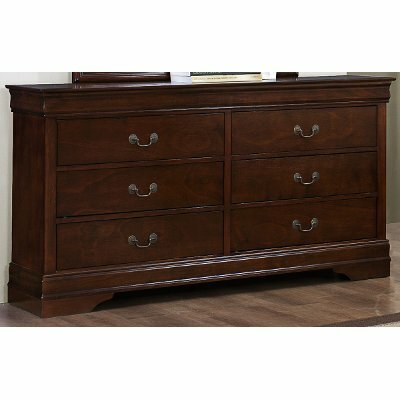 This 6-drawer dresser, available at RC Willey, is a traditional, elegant, and timeless piece that is sure to be cherished by your family for years to come! It features a burnished brown cherry finish, antiqued metal bale hardware, and distinct framing. 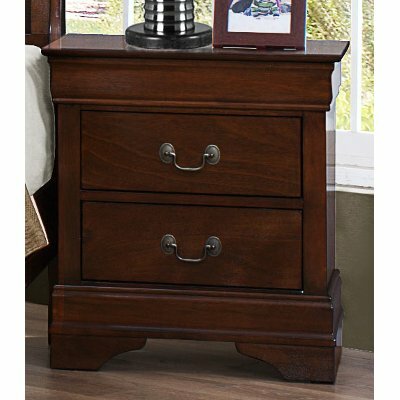 This 2-drawer nightstand, now at RC Willey, is a traditional, elegant, and timeless piece that is sure to be cherished by your family for years to come! It features a burnished brown cherry finish, antiqued metal bale hardware, and distinct framing. Traditional Brown Cherry 4 Piece Queen Bedroom Set - Mayville is rated 4.6 out of 5 by 5. Rated 4 out of 5 by need4shopping this product has a sleek look I'm enjoying my bedroom set.it was delivered on time, the gentlemen were very fast and pleasant.they set the whole set up for me .all I had to do is show them were to place it.very pleased. Rated 5 out of 5 by Homeshopper23 Beautiful I was a bit hesitant when I purchased the set as I was afraid the color would be too dark, but it's perfect and the coloring matches everything very well. I love how stray it all is as well. Rated 5 out of 5 by alma14 good quality furniture at a very nice at a great price My name is Patty from Ontario Oregon and I recently purchased the Mayville 6 piece bedroom set from RC Willeys and I love it. Before buying this product I shopped around and found sets similar like the Mayville at very high prices. 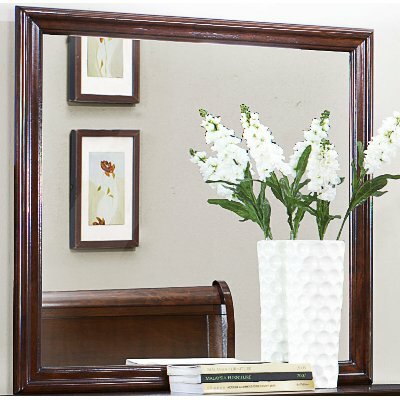 I found the prices at RC Willeys are very affordable and you are getting good quality furniture. 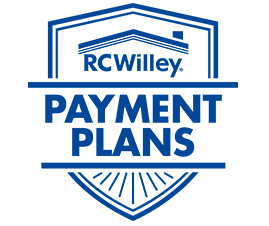 The staff there make you feel very welcomed and also are extremely helpful and very friendly. I am very satisfied with my purchase and are very hopeful in returning to their store again in the future. Rated 4 out of 5 by kjcrawf You get what you pay for... We decided to purchase this bedroom set when it went on sale at a unbeatable price. I was VERY excited to recieve this set as I had been eye-balling it for a few months. When we recieved the items, I was not as in love with the set as I expected to be. I quickly realized that in this particular case, we got what we paid for. The wood on the bed is probably the biggest downfall as it isn't as solid as I expected. The headboard and footboard are rather light (easy for one person to carry), but what I'm talking about is the base. We HAD TO go to a hardware store and purchase some plywood to help support our mattress as it "leaked" through the three STICKS that came with the set. I would reccomend this set FOR THE RIGHT PRICE. It will be a good set to use for a couple of years and then we can hand it down to our son/daughter when we decide to purchase a better set.